What Else can I Expect from an Online Doctorate in Healthcare Management Program? A doctoral degree in healthcare management opens the door to a number of very well-paying management and administrative careers in the healthcare industry. When you have a career in healthcare management, you're responsible for managing the delivery of quality healthcare. This involves planning and coordinating everything from human resources to public relations, finances to research and evaluation. More than anything else, healthcare management is an excellent career for strong leaders who want to improve healthcare organizations. The Bureau of Labor Statistics predicts that healthcare occupations will grow 19% from 2014 to 2024, a rate much faster than average for all occupations. Yes. Earning a doctorate in healthcare management will make you stand out from most other prospective employees. Holding a relevant degree demonstrates to future employers that you have a thorough and nuanced understanding of healthcare management and the healthcare field more broadly. You'll be a more competitive job candidate and able to earn a higher salary when you graduate. It depends on the program, but generally you do need significant related work experience to be accepted into an online doctorate in healthcare management program. It's not uncommon for programs to require a minimum of five years of professional experience in a healthcare management administration. Most doctorate in healthcare management programs are designed for working professionals. You can find the right online program by figuring out what program characteristics are most important to you. Issues to consider include cost, program length, faculty, course selection, how the dissertation process works, and if there are any in-person requirements. Every program is different, so you'll need to compare a few before choosing one. CAN I WORK WHILE I COMPLETE MY ONLINE DOCTORATE IN HEALTHCARE MANAGEMENT? Yes. 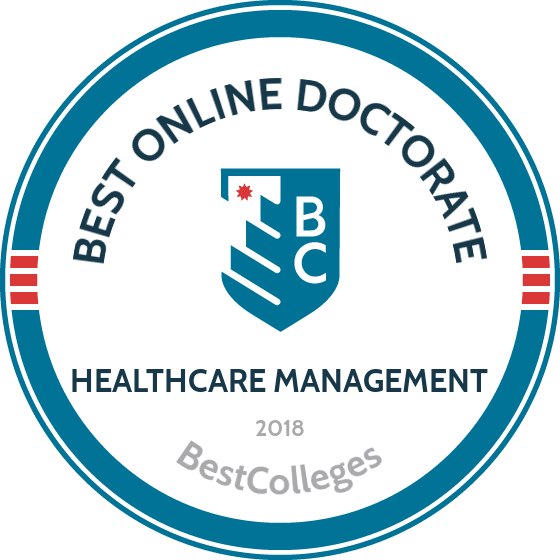 Most online doctorate in healthcare management programs are specifically designed for working professionals to be able to keep working while completing the degree. This is a major benefit of enrolling in an online program. You can keep your job and complete coursework and your dissertation on your own time, whenever that might be convenient. Based in Mount Pleasant, Central Michigan University's tailors its online doctorate in healthcare management to the needs of professionals already working in health administration. The school's 63-credit doctor of health administration program prepares graduates to take leadership roles in the field by instilling knowledge in a broad range of issues, including policy and regulation, health communication, information technology, research methods, human resources, and ethics. Students go through the program in a cohort, meaning that you follow a set schedule of courses that you take with the same group of people from start to finish. The hybrid program is primarily online, with 15 online courses, but the program also requires six face-to-face seminars. In-person intensive seminars each last two-and-a-half days long and are offered regionally by subject matter experts. Students must also complete a comprehensive essay exam and a 12-credit dissertation on a specific issue in healthcare administration. Tuition costs the same per credit, regardless of where you live. Franklin University in Columbus, Ohio, offers a 58-credit doctorate in healthcare management. Students must complete a research core (16 credits), major area courses (20 credits), and electives (12 credits). Courses offered include organizations, community, and global health; applied statistics; and advanced healthcare analytics. Learners must also complete a ten-credit dissertation. Franklin's doctor of healthcare administration program is well known for a unique dissertation structure that helps student design, research, and complete their dissertation step-by-step. This special dissertation program allows Franklin doctoral candidates to complete their degrees at an accelerated pace. Franklin charges online students the same tuition regardless of residency status. Healthcare administration program faculty are experienced industry professionals who are also active in the community. Franklin does not require applicants with a minimum 3.0 GPA to take the GRE or GMAT. Franklin’s transfer policy allows doctoral students to transfer up to 24 credits towards their degree, including previous doctoral work and professional credentials. Christian institution Liberty University offers a 60-credit doctoral degree in healthcare management through its Graduate School of Business. The school delivers its doctor of business administration in healthcare management program completely online, with no on-campus requirements. However, interested students can attend optional in-person intensive courses at Liberty’s campus in Lynchburg, Virginia. Students may transfer up to 15 credit hours into the program, and 12 hours of an MBA specialization may apply. Students pay the same tuition rate regardless of their residency status. Required courses include strategic thinking for decision-making, human resource development, and advanced business research methods. Students spend a total of 15 credit hours working on their dissertation. Liberty's DBA in healthcare management program has a competitive admissions process that requires applicants to submit a statement of purpose and proof of a master’s of business administration, master’s of science in accounting, or master’s in information systems. Medical University of South Carolina’s doctoral degree in healthcare management is a three-year, 54-credit program that starts each fall. The school's doctor of health administration executive program combines face-to-face learning at the school’s Charleston campus with online instruction. Each semester you’ll spend a long weekend attending classes on campus. Students complete 36 credit hours of coursework and 18 credit hours of dissertation work. Courses tackle subjects like applied research, healthcare information resources, and financial management. Students spend the program's third year working individually on supervised dissertation research. Admission requirements include a minimum of five years of experience in the healthcare field in a management or policy position and a post-baccalaureate or master’s degree in one of the following fields: health administration, business administration, public health, or public administration. Other requirements include an understanding of health finance, statistics, organizational behavior, health economics, and epidemiology. Students generally complete the University of Mississippi’s School of Health Related Professions’ doctor of health administration program in three years (nine semesters). UM is accredited by the Southern Association of Colleges and Schools Commission on Colleges. Most of the program is offered online, with some mandatory on-campus sessions. The program is designed for part-time, nontraditional students, although students who do not fall into this category may also be admitted. To be accepted into the online doctorate in healthcare management program, applicants must hold a master’s or professional degree from a regionally-accredited institution with a GPA of at least 3.0 and have five or more years of experience in healthcare management or a related field. Applicants must also submit GRE scores and a current resume. A few examples of the program's required courses include leadership strategies in health entities, strategic change management, and applied research techniques. Doctoral programs in healthcare management teach students how to improve healthcare delivery through effective leadership. Students learn skills in leadership, research and evaluation, information technology management, and policy and legal analysis. Below you'll find a sample curriculum for an online doctorate in healthcare management program. Courses and curriculum may vary depending on the school and program that you choose. Introduction to Health Policy: This course covers health policy and economic issues within the system of healthcare and explores a variety of perspectives, including legal, economic, social, and cultural. The course also examines the relationships between government, business, and non-profit groups in relation to healthcare delivery. This course prepares graduates to work as managers and administrators of healthcare organizations. Communications in Healthcare Organizations: This course explores communication issues, both internal and external, that may arise in health organizations. Topics covered include knowledge management, public relations, and mediation and negotiation. Students gain an understanding of the effect of communication issues in healthcare delivery and healthcare organizations. This course prepares graduates to work in healthcare management and administration working on communications issues. Principles of Epidemiology: This course examines epidemiological principles and tools as they relate to healthcare management and decision-making. Students learn about health behavior in different populations, preventive programs, and healthcare delivery systems. Current issues in epidemiology are discussed. This course prepares graduates to work as researchers or in healthcare management. HOW LONG DOES IT TAKE TO GET AN ONLINE DOCTORATE IN HEALTHCARE MANAGEMENT? Most online doctorate in healthcare management programs take about three years and 60 credit hours to complete. Program characteristics that affect the length of an online degree include course schedules/academic calendar, on-campus requirements, and internship requirements. Another factor that might affect how long it takes you to complete your degree is whether or not your program employs individually-paced or cohort learning. Programs that use cohort learning require that a group of students take their courses together from start to finish using a predetermined schedule. You'll usually have less flexibility and freedom with this model of learning, but you'll gain a sense of community and camaraderie. Another factor to consider is how much help you'll have with your dissertation and how long it usually takes a student to complete it. Programs with more support during the dissertation process can usually be completed more quickly. Attending an accredited school for your doctorate healthcare management degree is very important. Accreditation is a process that schools undergo to make sure they meet certain educational standards. If a school is not accredited, it means that they have not demonstrated that they meet quality educational standards. You might notice that schools can either be regionally or nationally accredited. Regional accreditation is more common and is almost always accepted as transfer credit by other schools. National accreditation is more common at for-profit schools and vocational and trade schools, and is often not accepted as transfer credit. In general, it's recommended that you look for a regionally-accredited online school. Look for accreditation agencies like the Southern Association of Colleges and Schools and the the New England Association of Schools and Colleges. There are not any field-specific accrediting agencies for doctoral programs in healthcare management. There are two main organizations that are involved in the accreditation process in the United States: the Department of Education (ED) and the Council for Higher Education Accreditation (CHEA). The ED is a federal department that creates educational policy throughout the country and organizes distribution of federal financial student aid, including student loans and grants. The CHEA is a group of colleges and universities that create standards for regulating accrediting agencies. To see the ED's database of all the accredited schools in the U.S. and to check if your school is accredited, go here. More healthcare professionals are enrolling in online doctorate in healthcare management programs as the opportunities for graduates of these programs increases. The healthcare management field continues to rapidly expand, and professionals who hold a doctoral degree in healthcare management often secure well-paying positions at, for example, hospitals, universities, private medical practices, nursing homes, and research organizations, where their higher level of education makes them more competitive than those who possess only a bachelor's or master's degree. Graduates of healthcare management doctorate programs frequently discover that their degrees pay off financially, and they also tend to find their jobs rewarding on a personal level, as they work to improve the way that patients experience healthcare. In addition to differences in individual workplaces, professional experience level, and the type of organization you work for, your geographic location impacts your annual earnings as a medical and health services manager. The following table features data from the Bureau of Labor Statistics regarding expected salaries for medical and health services managers in the top five paying states in the U.S.
An online doctorate in healthcare management opens up a variety of career paths in the healthcare industry. Graduates typically pursue managerial positions at healthcare facilities or higher education institutions. This field is ideal for anyone with strong leadership skills who is interested in improving the delivery of healthcare. Managers and administrators in healthcare need to have a broad range of knowledge, from human resources to finances and communication to information technology. Medical and health service managers plan and coordinate health services at health facilities, clinics, and medical practices. Their main objective is to improve quality in the delivery of healthcare services. They manage staff, develop goals, manage finances, create schedules, organize records, represent the facility, and communicate with staff. A candidate must hold at least a bachelor's or master's degree to be hired at this level, and a doctorate provides candidates with a significant edge. Top executives work in all industries and create strategies and policies to make sure that organizations meet their goals. They plan and coordinate the operational activities for their organization. They usually work long hours and travel frequently, have at least a bachelor's degree, and many years of experience. A doctoral degree makes a candidate stand out among their competitors. Human resources managers work in all industries, where they're responsible for planning and carrying out the administrative functions of an organization. They usually recruit, interview, hire, and fire staff and serve as an intermediary between an organization's managers and its employees. Professionals in this position require at least a bachelor's degree, and a candidate with a related doctorate certainly stands out. Training and development managers work in all industries and plan and coordinate training and professional development for the employees at their organization. They must hold a bachelor's degree and sometimes a master's degree. Postsecondary teachers provide instruction in their subject area to students at the post-high school level. They also conduct research and publish their findings. Teachers at most colleges and universities require a doctorate. Joining professional organizations in the field of healthcare management presents numerous opportunities for current students and recent graduates who have earned their doctorate in healthcare management. You'll be able to connect with other professionals in the field and learn about job opportunities, new innovations in the sector, annual conferences, and continuing education programs. Many professional organizations also provide career services and maintain job boards for their members. This global network of universities, colleges, individuals, and groups improves health and healthcare by promoting quality healthcare management and policy education. ACHE is a global society of professional healthcare executives. The group works to promote excellence in healthcare management and for its members. AONE provides leadership, advocacy, research, and professional development to to advance nursing leadership and excellence. Paying for your doctorate in healthcare management can seem daunting. Luckily there are numerous ways to fund your degree, including federal student loans, grants, work-study, and scholarships. The first step any student should take is to complete a Free Application for Federal Student Aid (FAFSA) form as soon as possible. By completing one form you'll be able to find out every type of federal student aid you are eligible for at once.